piCture pOlish is nothing new to you if you've been a nail blog reader for long enough. You may know the brand by its adorable bottle shape and choice in font. Or you may know about their insane glitter mixes or their perfect pastels, which I've mashed up into a pastel festival on my nails. You've at least heard about the blogger collaboration shades, right? piCture pOlish is a wonderful brand, made popular by the very girls who love it most...bloggers! The Australian brand has really embraced the polish people that have blossomed into a real community. They rally behind us, so we rally behind them! Check out the shades, and you'll see what I mean. 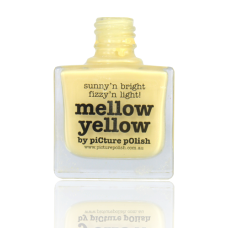 Mellow Yellow (2 coats) is a lemon-butter pastel creme. If your friend ever expresses how much they dislike yellow polish, simply show them this to change their mind. Peaches n' Cream (3 coats) is a pinkish-peach creme. My notes for it are "Barbie's skin tone", which is pretty spot on, wouldn't you agree? Mad Magenta (2 coats) is aptly named. It's a great substitute for a neon purple, and doesn't require a white base layer like true neons. You've seen this color before on my freehand floral look! It was too pretty not to debut sooner. Sky (3 coats) is an incredibly pale sky blue. I like its slogan: "Go on broaden your horizons!" Well thank you polish, I think I will take that little motivational speech to heart and make something of myself. Eventually. Honey Dew (2 coats) is a bright pastel teal...a wonderful Easter color! 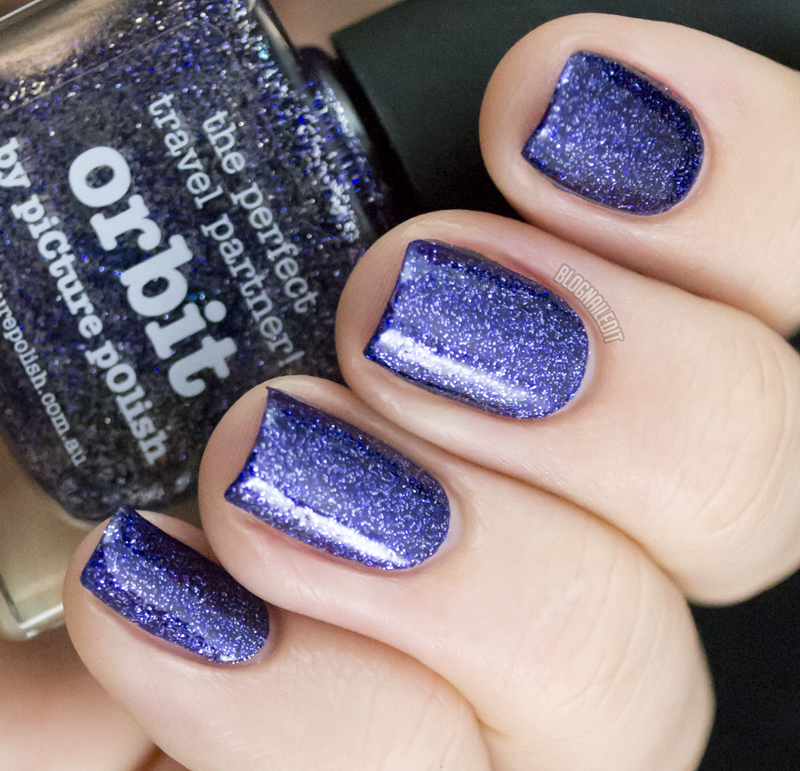 Orbit (2 coats) is royal blue and silver glitter in a darker blue glitter base. SO MUCH GLITTER! Look at how it moves in the sunlight! Monroe (2 coats) is a magenta glitter base with holographic shimmer. I wish there was a video of this in sunlight...it behaves similarly to Orbit. Gorgeous. 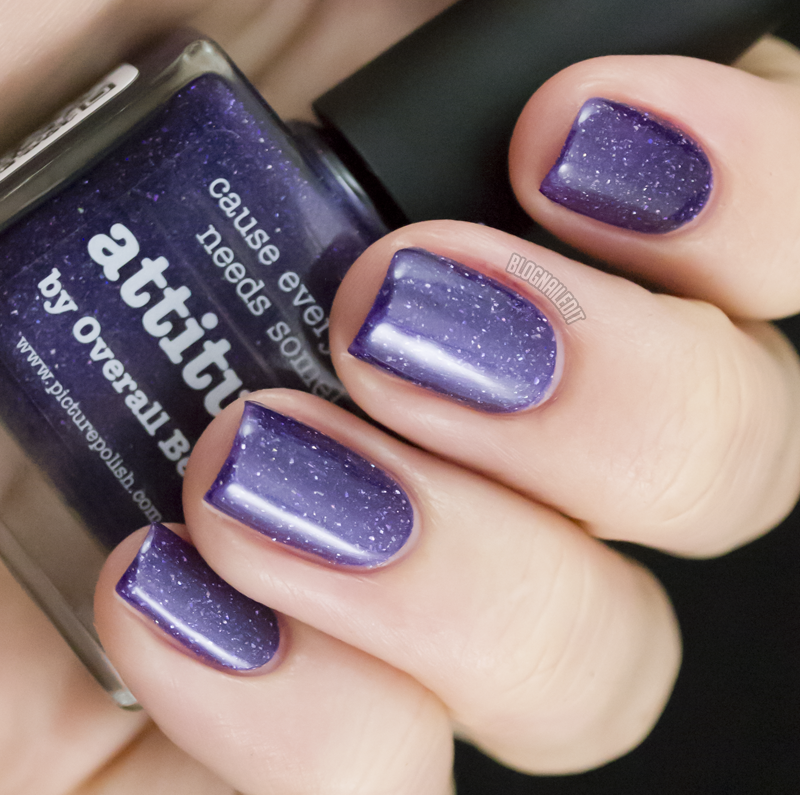 Attitude (2 coats) is a greyish purple satin base with small, subtle holographic flakes. 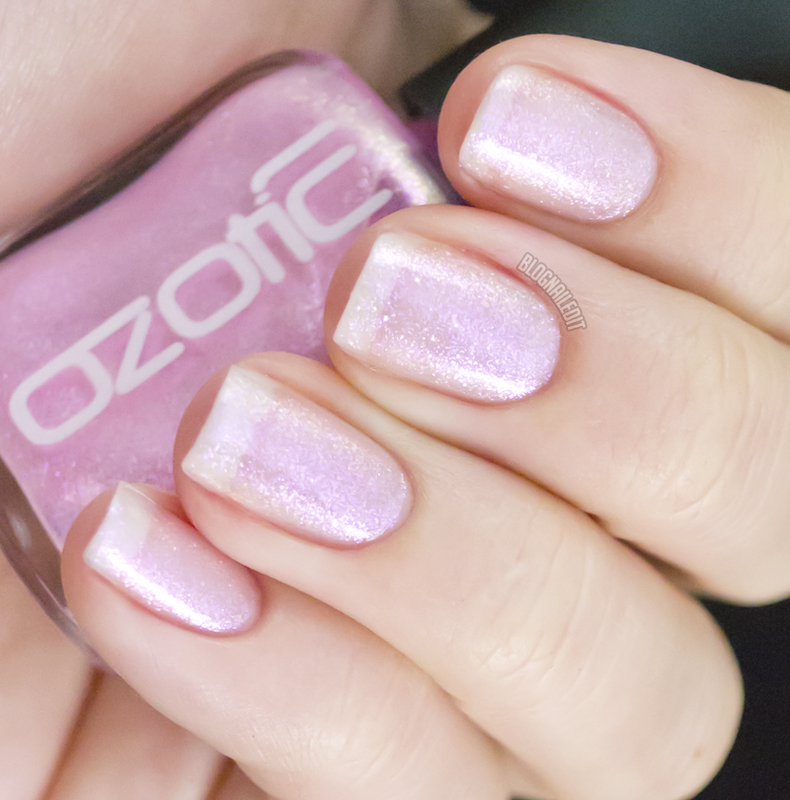 In addition, piCture pOlish (the brick and mortar store) sells a few other shades, including OZOTIC shades, like this one, called Sugar. Sugar (2 coats)is a pink and yellow iridescent shimmer, with a very slight light pink base. Shipping is worldwide, and worth the shipping. Only two polishes needed three coats in everything I just reviewed, so rest assured their formulas are wonderful. Which of them is your favorite? I've got mine: Honey Dew! These products were sent to me by piCture pOlish. The reviews are based entirely on my experience with the products and were in no way influenced by anyone. I just spent like 5 minutes staring at that quilted nail, trying to figure out how you did it. Then I realized it was probably nail studs... right? Please tell me that's right! Otherwise I have no idea how you did that, and it looks so cool! These are all gorgeous, but for some reason Peaches n' Cream is calling my name the most of all! Oh! I love picture polish so much and I'm super bummed I cannot get it here ... shipping is waaay to expensive! Thanks for the lovely swatches! Gorgeous! Wish I could afford to have Picture Polish shipped here!